I roughly drew around the bottle onto tissue paper to create two circles for each side of my bottle. I used different shades of StazOn to stamp layers of images from the sets Tiny Things and Paris Memoirs finishing off with the Frenchman from Paris Memoirs on one piece and the Eiffel Tower on the other in Black, as my focal images. 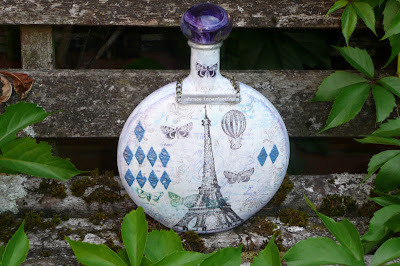 I then applied them to the bottle using Gel Medium, and blended some Distress Ink in Chipped Sapphire and Shaded Lilac around the edges of the bottle to highlight its round shape and frame it. I mixed blue acrylic paint with embossing paste and spread it through TCW Distressed Harlequin Stencil and highlighted the raised areas with some watered down Viva Ferro on a brush. 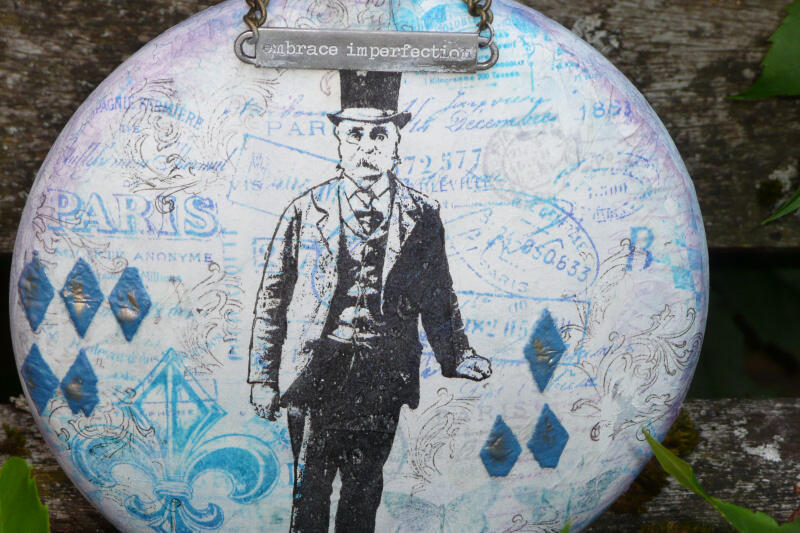 I picked the Tim Holtz wordband 'Embrace Imperfection' and rubbed some white acrylic paint into the wording to highlight and attached it to a piece of chain to go round the neck of the bottle, in the style of an old port decanter. I bid for some decanter stoppers on ebay and this beautiful blue one led my colour choices for this project, as I used it to replace the original plain one, as a finishing touch. Love this! So beautifully stamped (using fab stamps), it looks fantastic! 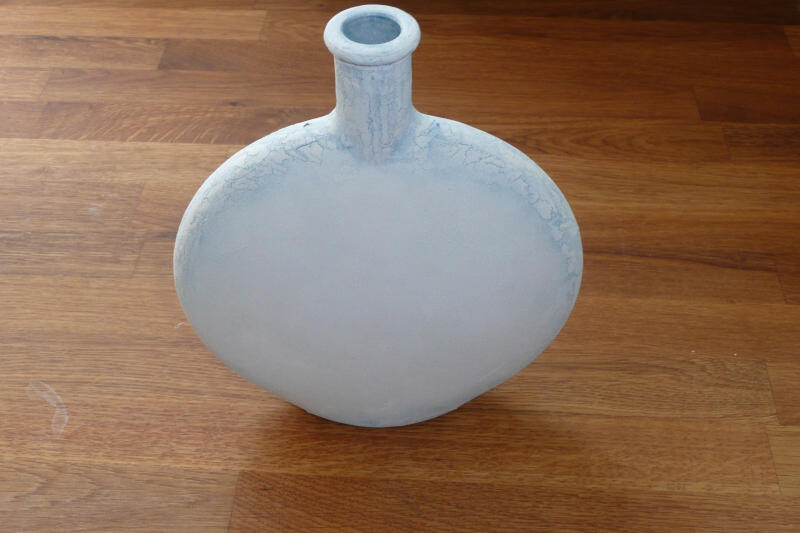 Great bottle shape as a base and a lovely finished project, beautiful colours and textures! I love this bottle, Lucy! I love the crackle painted edges! 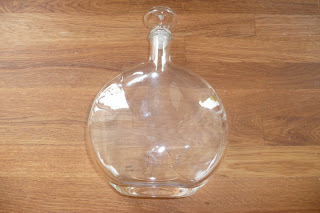 That is such a great design idea rather than crackling the entire bottle. Love it! Fabulous altered bottle, Lucy! 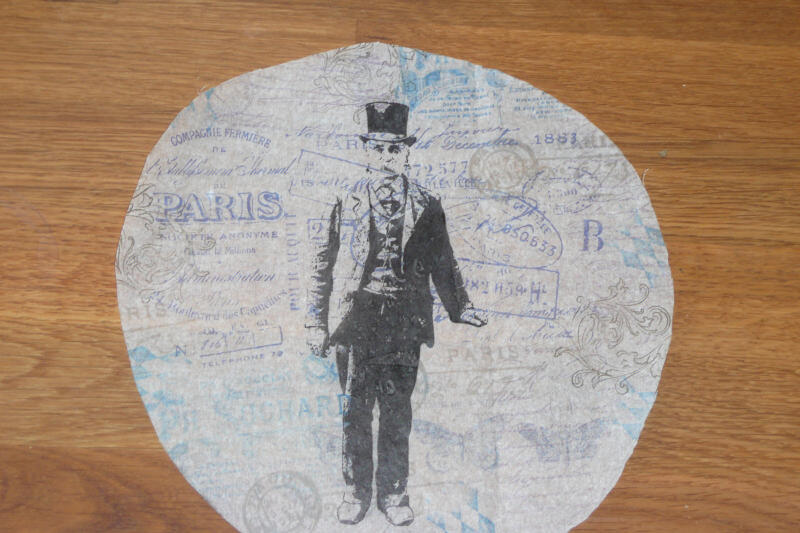 Love the crackled background with the Parisian theme! Congratulations on your GDT spot on EP! Hugs! So stylish and classy. Brava! 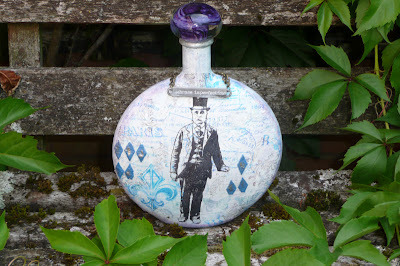 Gorrrgeous altered bottle Lucy, loving the parisan feel to it!!! Fabulous project, Lucy! Great colors and great images!! oh wow, love how you altered this bottle the stamp is perfect for this type of bottle. Gorgeous. Love the bottle and also love that gorgeous top !! What a fantastic altered bottle, Lucy - it's an absolutely gorgeous creation! 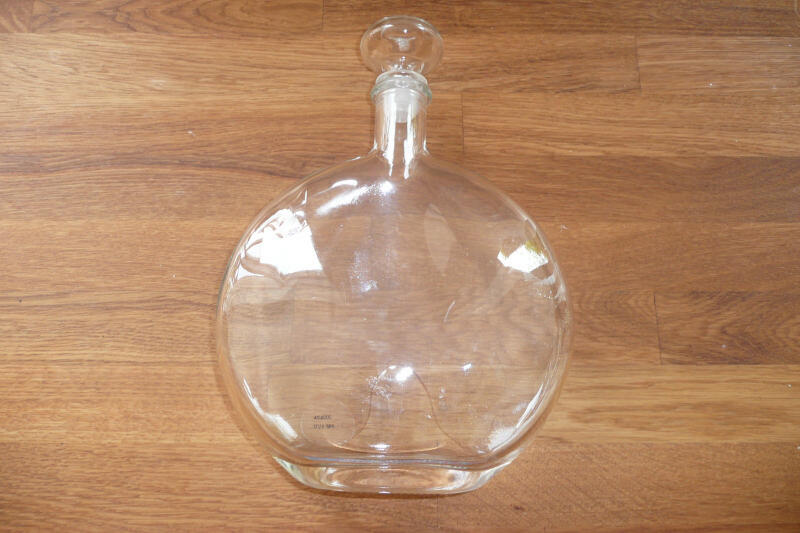 I saw the bottle in real life (big smile) and it is absolutely stunning! Lucy, this is beautiful. I love the crackle and the wonderful stamping. The Paris theme is so fun and your colour scheme so lovely. I like the inking toward the edges of the bottle to enhance the shape. Beautiful stopper and such an inspired way to use the word tags.